You can help Mother Nature by getting your hands dirty or taking it easy. 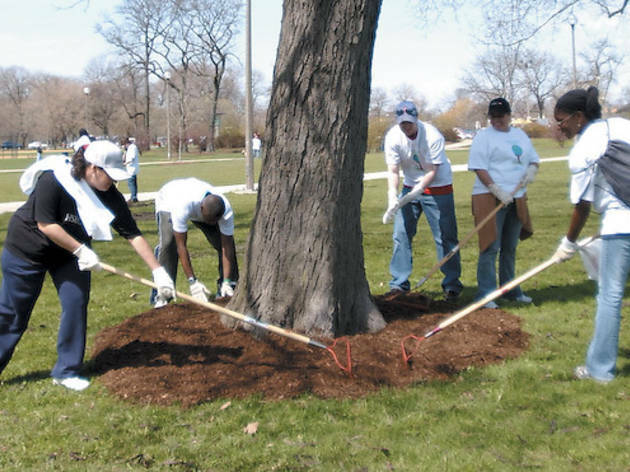 Photograph: Chicago Park District Spruce up a local park for Earth Day. Earth Day Workshops Peggy Notebaert Nature Museum (2430 N Cannon Dr; urbanhabitatchicago.org). Sat 23, 9am–2pm; $10–$60. If your ecofriendly to-do list needs to grow past “buy energy-saving lightbulbs,” try these five workshops. Learn methods of composting, gardening and recycling runoff water. “Smart Home” Museum of Science and Industry (5700 S Lake Shore Dr). Fri 22–Jan 8, 2012. Even if no one lives in “Chicago’s Greenest Home,” you’ll still feel as if you’re snooping on your neighbor’s high-style, upcycled interior designed by Scout. Earth Day cleanup Parks including Simons Park, (1640 N Drake Ave; chicagoparkdistrict.com). Sat 23, 9–11am; free. Various Chicago Park District green spaces are asking community members to stop by and help clean up. The park warns: Expect to get cold and dirty. Earth Day at Daley Plaza (50 W Washington St; cityofchicago.org); Fri 22, 11am–2pm; free. The Chicago Climate Action Plan (CCAP) and its partners dole out swag and tell you how you can aid its cause.